LOS ANGELES, California, August 19, 2015 (ENS) – High performance renewable diesel fuel was introduced to Southern California drivers this week by Propel Fuels, based in Sacramento. Called Diesel HPR (High Performance Renewable), the fuel is a low-carbon, renewable fuel that meets petroleum diesel specifications and can be used in any diesel engine. Refined from recycled fats and oils, Diesel HPR does not contain biodiesel or petroleum diesel. It is diesel refined from renewable biomass through Neste’s advanced hydrotreating technology called NEXBTL. Neste, based in Espoo, Finland, is the leading producer of renewable diesel in the world, with an annual production volume of more than two million tons. The company is the world’s largest producer of renewable fuels from waste and residues. Diesel HPR meets the toughest specifications required by automotive and engine manufacturers. The fuel is designated as ASTM D-975, the standard for all ultra-low sulfur diesel fuel in the United States. It is recognized as “CARB diesel” by the California Air Resources Board, although it contains no petroleum. According to the U.S. Department of Energy’s Alternative Fuels Data Center, renewable diesel’s high combustion quality results in similar or better vehicle performance than conventional diesel. California Air Resources Board studies show that renewable diesel can reach up to 70 percent greenhouse gas reduction compared to petroleum diesel. “It’s good to see this high quality, low-carbon diesel coming to corner gas stations across Southern California,” said Mary Nichols, who chairs the California Air Resources Board. “This renewable diesel will now be conveniently located for all consumers, and joins a growing suite of new, cleaner transportation fuels in California thanks to our Low Carbon Fuel Standard and forward thinking companies like Propel,” she said. Fleets and individual drivers choosing Diesel HPR enjoy better performance, reductions in greenhouse gases, and improved local air quality due to less harmful air emissions such as nitrogen oxides (NOx) and particulates (PM 2.5) as compared with petroleum-based diesel. 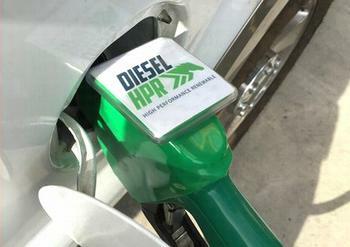 Diesel HPR made its North American debut in March 2015 at 18 Propel stations across Northern California, where the company has seen strong, positive consumer response. In first three months of HPR diesel sales, Propel saw a 300 percent increase in gallons sold compared to its former biodiesel product, B20, which is 20 percent biodiesel and 80 percent petroleum diesel. In August, Propel added 13 new retail locations in the southern part of the state. Drivers say they appreciate the new product. “I’m thrilled to have Diesel HPR available to me here in California. I could tell a difference in the way my car ran within 10 minutes,” said Erik M. of Folsom, California, who declined to give his last name. “After running Diesel HPR fuel, the truck definitely feels like it has more torque. There seems to be better fuel economy too. I also notice significantly less smoke,” said James C. of Point Richmond, California, who also chose to keep his last name private. Propel has just launched Diesel HPR commercial and bulk availability for business and government fleets statewide. Delivered in bulk to businesses and agencies, Propel’s Diesel HPR is bundled with the company’s patented CleanDrive® emissions accounting software, allowing fleets to easily quantify and report greenhouse gas reductions and air quality benefits.